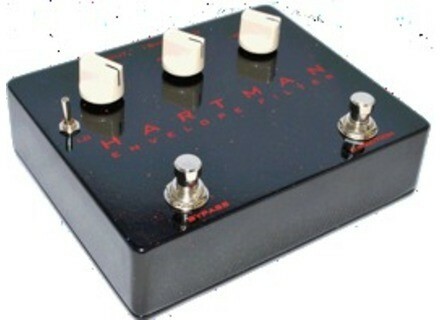 Envelope Filter, Wah-Wah/Auto Wah/Filter for Guitar from Hartman Electronics. Inspired by an envelope filter pedals of the 1970's and developed with guitarist Mark Karan (Delaney Bramlett, Bob Weir & Ratdog, Jemimah Puddleduck) the Hartman Envelope Filter employs low-noise components and an optically controlled state-variable filter for timbre and response. A second footswitch permits change of filter sweep direction for access to a palette of classic filter sounds from funky chirps and saturated quacks to flute-like attacks and horn-tones. An active Mix control blends filtered and unfiltered signal. Factory preset internal trim pots permit additional tuning of filter voice and action. • Sensitivity, Peak, and Mix controls. • Hi-Lo Filter Peak Frequency Switch. • Footswitch control of Filter Sweep Direction. • Plated-Through-Hole PCB (printed circuit board) construction. • Powder-coated metal enclosure with true-bypass switching. • 18VDC 2.5mm External power jack. • Made in U.S.A. One-Year Warranty. Line 6 POD Goes HD Line 6 say they scoured the globe for the "16 vintage and modern amps every guitarist will covet." New Basslab Theta & Soul Tops Basslab is presenting new wood tops for their Theta and Soul models.